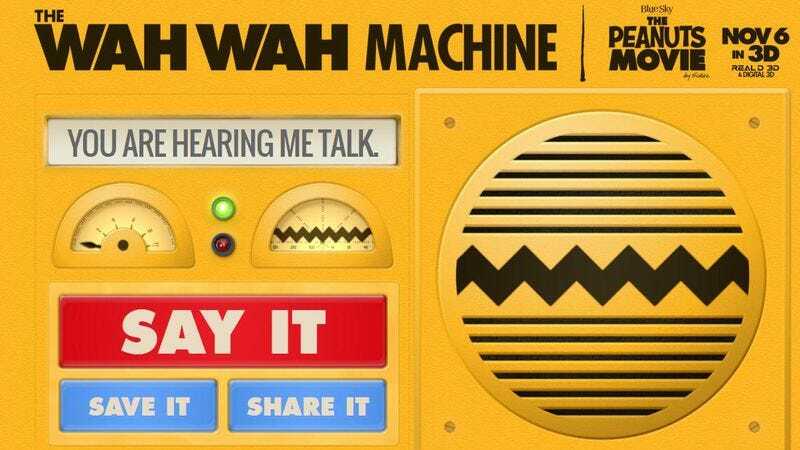 In time for The Peanuts Movie, Blue Sky Studios and 20th Century Fox have debuted The Wah Wah Machine! The famous “wah wah” voice of Miss Othmar, beloved teacher of the Peanuts gang, is now just a click away. Simply type your message into The Wah Wah Machine and Miss Othmar (voiced by Trombone Shorty in the film and the machine) will say it for you in her famous, musical voice. You can even share your Wah Wah message with you friends on Twitter and Facebook. Simple yet amusing, the Wah Wah Machine works well and does what it promises. Just type in a twee-length phrase, click “SAY IT,” and a corresponding series of “wah”s will emerge from a yellow-and-black-striped speaker, matching the cadence of the original words. Never has the sound of adult authority been so comforting.